For longer than you’d like to admit, you’ve had pain in a tooth on the lower right side of your mouth. It’s sensitive and no matter what you do, the discomfort lingers – you’ve stop drinking hot beverages, eliminated cold foods, and even stopped eating sweets – but nothing helps. When you see your dentist in San Antonio, they inform you that you have enamel erosion. But luckily for you, the team at New Image Dentistry has options to help restore your tooth and end the pain. And, your enamel can face erosion from medications that weaken it, grinding your teeth (both during the day or at night), and even some vitamins – especially an overabundance of Vitamin C.
How Can New Image Dentistry Treat My Enamel Erosion? In the earlier stages, we can help by providing fluoride treatments that can restore your teeth and augment the strength of your enamel. We can offer suggestions and prescription treatments for dry mouth, if this is the cause of your erosion. If more advanced treatment is needed, we can provide tooth colored fillings, dental crowns, or porcelain veneers. What Can I Do To Prevent Enamel Erosion? Brush your teeth gently for two minutes, twice a day, with a fluoridated toothpaste. Floss at least once daily (although twice is better). Drink lots of water to keep your mouth hydrated. Limit the amount of acidic foods you eat. Be mindful of your intake of lemons, limes, grapefruits, and oranges (along with their juices) and vinegar. Talk with our team or your doctor if you have frequent heartburn, indigestion, or acid reflux issues. Get help for eating disorders by working with your doctor, or call the National Eating Disorders Association Information & Referral Helpline at 1-800-931-2237 – help is available, and you’re worth it, no matter what the negative self-talk you hear might say. If you’re pregnant and dealing with morning sickness, don’t just suffer through it – there are treatments for you that are safe for both mother and child. See our team at least twice a year for regular checkups and cleanings. 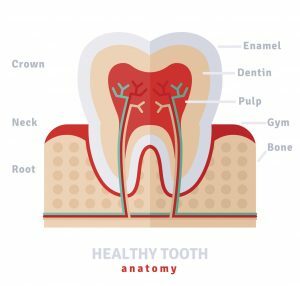 Now that you know what enamel erosion is and how you can prevent this, schedule your appointment with the team at New Image Dentistry to keep your pearly white radiant and healthy!